FARMtastic birthday celebrations and more! Oink, Baa, Moo... We want to party with you! Planning a birthday party or special celebration for your child's team, youth group or class? 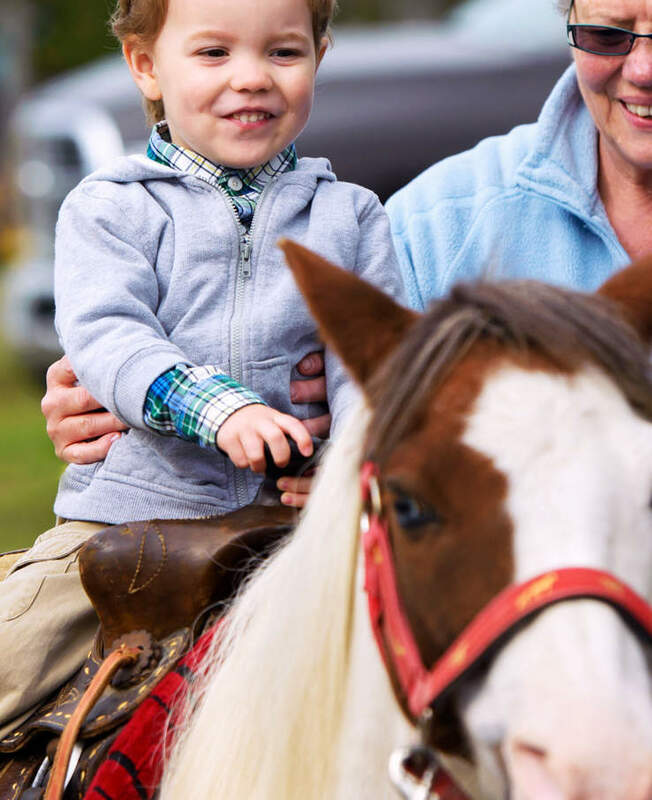 Lucky Ladd Farms offers a unique experience filled with non-stop fun for all ages! Let's get this party started... Planning has never been easier, three great packages to choose from. All packages and pricing subject to tax. You are welcome to bring in a birthday cake and/or ice cream when having scheduled a party at Lucky Ladd Farms. If you would like to serve additional snacks, drinks or a meal, we ask that you use our menu. We are sorry, but no other food or drink is permitted inside the Farm Park. Food orders must be received five-days in advance of your event and paid-in-full at the time of ordering. Visit our online store to place your order. All food and drinks are served 30-minutes after your party's scheduled start time. Food pricing is subject to tax. Treasured souvenirs like Lucky Ladd Farms lovable plush characters and stuffies, along with pumpkins and other fun merchandise can be added to your ticket on-site the day of your event. CAN YOU EXPLAIN THE CHECK-IN AND PARTY PROCESS FOR MYSELF AND GUESTS? Party hosts may arrive up to 15-minutes prior to your schedule party time. You will check-in at the admissions window located at the Big Red Barn. Please remember to bring a credit card which will be kept on hold until you check-out for the day. Upon checking in, our staff will review details regarding your package, issue a wagon and direct you to your reserved table location. Please have your tables cleared and area free from trash before the end of your two-hour reservation as we will need to promptly begin preparations for our next party. Guests will also check-in at the same window at the Big Red Barn. Each guest (adults and children ages 2+) will receive a wristband for entry and directed to your party site. We keep a running tally of all guests for your event and will advise you if it's better to upgrade/downgrade your party package size or simply pay for any additional guests over your package limit. Party guests that are season pass members will check-in as normal so they are not counted towards your guest total. Should you opt to not cover admission for your adult guests or tag-a-long siblings, then kindly advise them in advance the standard admission rates of $13.99-Adults and $11.99-Children (Ages2-12) plus tax. Ice beverage pitchers and cups are brought to your tables shortly after your scheduled party time. If you've ordered food from our menu then it will be served to your group 30-minutes after your party starts. Food service times may not be altered. Should you like to add drink pitcher refills during your party, please visit MooMoo's Parlor, located at the back of the Big Red Barn, to place your order and they will deliver it to your tables. NOTE: Food orders with discounted pricing must be placed online a minimum of 5-days in advance of your event. Alternatively, concessions are available full-price on site, but wait times could be long since food is cooked upon order. If you reserved a FARMtastic or Barnyard Adventure Party Package, then you will go to the Big Red Barn to pick-up pony ride tickets and gem mining rough after all guests have arrived. Animal feed will be provided to you upon check-in for your guests. Parties at Lucky Ladd Farms are self-guided. It's up to you what activities to do and when to do them. Most guests will start with the animals, make their way through the playgrounds and then come back to their tables for cake and ice cream. Because there is so much to do, it's nearly impossible to do it all in just 2-hours. We advise opening gifts at home to make the best use of your time with family and friends at the farm. And remember you and your guests are welcome to stay for unlimited play even after your reserved table time has ended. After your big day comes to a close, go back to the Big Red Barn where staff will assist you with closing out your party. We look forward to your visit! I'M UNSURE OF HOW MANY GUESTS I MAY HAVE. CAN I ADD GUESTS LATER? When scheduling your party, we do not require an exact guest count. As your guests arrive the day of your event they must check-in at admissions to receive a wristband allowing entry to the Farm. We keep a running tally of all guests (adults and children) that have checked in for your party. We will make adjustments to reflect the appropriate number of guests when closing out your party the day of your event. AM I ALLOWED TO DECORATE MY TABLES? Yes. You may decorate as much or as little as you like. Your reservation includes four picnic tables for two-hours. Should you think you will need additional space for food, decorations or extra guests, then you may reserve additional tables at the time of booking. We do not allow any decorations to be taped, stapled or nailed to any of our tables, buildings or trees. Also, silly string, confetti, piñatas, streamers, shredded stuffing, glass containers and whistles are prohibited as they all pose choking hazards to our animals should the debris end up in our pastures. WHAT TIME CAN I ARRIVE TO SETUP FOR OUR PARTY? You may check-in 15-minutes before your scheduled party time. WE HAVE GUESTS WITH SEASON PASSES. CAN THEY USE THEM FOR ENTRY TO OUR BIRTHDAY PARTY? Yes. Season passes may be used when attending a birthday party and those guests do not count towards your package guest total. WHAT HAPPENS IF IT RAINS, OR RAIN IS FORECAST FOR THE DAY OF OUR PARTY? The Farm generally remains open during periods of light rain. Should it become necessary to close the Farm after your party has started due to lightening or prolonged periods of heavy downpours lasting more than 30-minutes, then each paid party guest will receive a rain-check to visit the farm another day at their convenience during the same season. If there is a high probability of heavy storms on the day of your party, then you may request to reschedule your party for another day up to 24-hours in advance of your event. Please email us with weather related requests to reschedule. Be sure to include your booking number. WHY DO I NEED TO PAY FOR ADULTS TO ATTEND MY CHILDS PARTY? Lucky Ladd Farms is a family destination with activities for all ages. Our facility requires admission for both adults and children and unlike other venues that encourage parents to sit on the side-lines and only watch; Lucky Ladd's stresses the importance of family interaction and play by offering many activities that parents and children can enjoy together creating memories that will last a lifetime. Your picnic table reservation is for two-hours, but you are welcome to stay and play at the Farm Park until we close at the end of the day. You may also arrive to play before your scheduled party time, but will not be able to access your reserved tables or setup that area until 15-minutes before your time slot. CAN WE EXTEND OUR PARTY TIME? Yes, if space is available. You may request to extend your table reservation time at the time of booking by making the request in the comments field. We cannot guarantee extensions to be available at all times and will notify you of approval. Additional fees will apply. Picnic table rentals are $7.50 per table per hour when extending your reservation time.